Today I'm sharing a layout which you can find in the Spring 2019 issue of Scrapbook & Cards Today Magazine! I started by die cutting my Home Sweet Home cut file from white cardstock using a Silhouette Cameo 3. I backed both "O"s with small photos of Chris carrying me over the threshold of our very first home :) I backed the remaining letters with designs from Paper 19 from Whimsical. This is one of my favorite ways to use these papers with all the different sections of patterns and colors. I used foam squares to attach the title onto the B-side of Paper 01. I kept the embellishing minimal and added a row of Floral Die Cuts & Leaves above and below the title. I typed, printed, trimmed, and adhered journaling strips next to the photos and I used the font Remington Noiseless. That's it! Easy peasy lemon squeezy! I also have a layout on the cover again using my Whimsical collection! Did you know you can download all of the Scrapbook & Cards Today magazines for free? 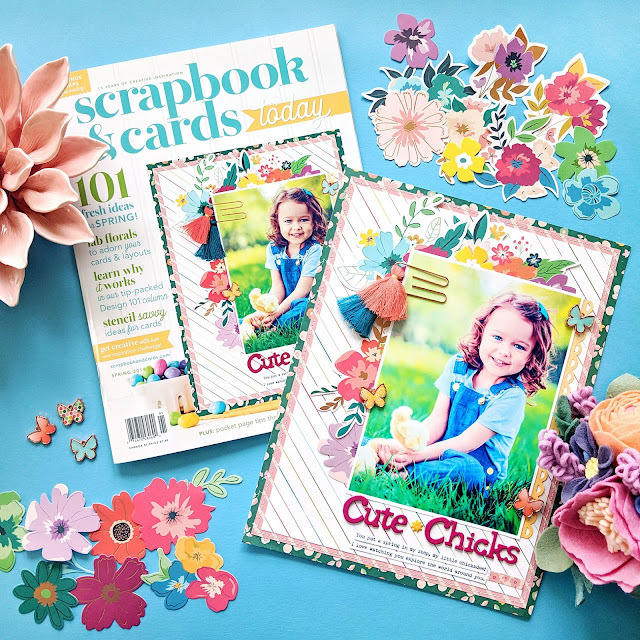 Head over to https://scrapbookandcards.com/spring-2019/ and enjoy looking through all of the beautiful pages filled with inspiring artwork! This is just gorgeous! LOVING the large title, the colors and those sweet photos!!! You are just amazing!!!! And huge congrats on the cover!! !